C-Air Filtration LTD - Dust Extraction & Filtration. Specialists In Keeping Your Air Clean. LEV COSHH Testing Experts . We offer Dust and fume extraction systems to suit any application, first class technology combined with prices that are some of the most competitive on the market. With customers such as Proctor and Gamble, Federal Mogul, Biffa , The MOD and the NHS you know with C-Air Filtration your dealing with a company you can trust. C-Air filtration Ltd has a strong reputation that has been earned by providing well designed, high quality products, together with a superior knowledge of the industry and our excellence in customer service along with the skills of our highly trained engineers. Please feel free to browse our website and our new on line store, we stock most dust collection spares such as dust cartridges and dust bags thru to solenoid valves and ducting. Not all the items we supply are listed in our store if you need anything that is not on our on line store then please call the office on 01706220373. We are a forward thinking company who's main priority is customer service we want to know you and your business. We operate a one contact policy from order to invoice your account manager will remain the same . 99% of our filters and spares are UK made and we are proud to support British Industry. Keep updated with our latest offers, news and events direct to your phone. We have a wide range of replacement filters, extraction systems, industrial machinery and spare parts to suit your needs, all available to purchase online. We are stockists of most makes of retrofit and OEM dust spares. Supplying all of your filtration and service needs in one go. 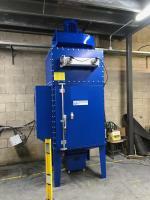 Fantastic new reverse pulse jet dust collector The CA004. Full System for weld and dust from metal fabrication installed with ducting in 2 days. Fantastic blue shade chosen by customer to stand out from the crowd, made to last well engineered not your average dust collector !